Confession time: I am a terrible twenty-something. To the joy of my parents (hi, Mom! ), the misery of my partying friends, and the general indifference in my own opinion, I am not by any means a partier. I have been drunk exactly 3 times in my life, been to a true “bar” perhaps twice, and am usually always the designated driver whenever there’s alcohol or drinking on a larger scale. Going out, getting drunk, and relying on random people (who themselves are quite possibly drunk as well) to get me home just does not sound like a fun time. Now, there is one bar in particular I’ve haunted almost all my life: the salad bar. My favorite restaurant growing up was a place I affectionately and appropriately called “The Salad Bar.” I’m sure the establishment had a different name (sadly, it’s closed now), but that was never important to me. What I fixated on was the massive salad bar, filled with every type of lettuce, salad topping, and dressing imaginable. It probably didn’t hurt that there was a dessert bar as well, with frozen yogurt, nuts, and chocolate in every color of the rainbow. It was with that memory I set out to create my own salad bar, paying homage to the very thing that draws me, and many others, to the buffet o’ beauty: choice. The very best part about a salad bar is the variety of choices one has to build their very own culinary creation, allowing a simple set-up to please a variety of palettes very easily: vegan, vegetarian, omnivore, kosher, food allergies, etc., etc. By that, I mean lettuce, spinach, mixed greens, etc. BF and I normally go with spinach because it has a good iron content, mild taste, and we use it a lot in other meals (sandwiches, smoothies, omelets, etc. ), so we can justify buying a big ol’ bin of it. Whatever you choose, make sure you like it, because this is the base of your salad. If you’re planning to eat your salad as a meal, having protein is essential in making sure that it’s a) a balanced meal, and b) one that will keep you fuller longer. 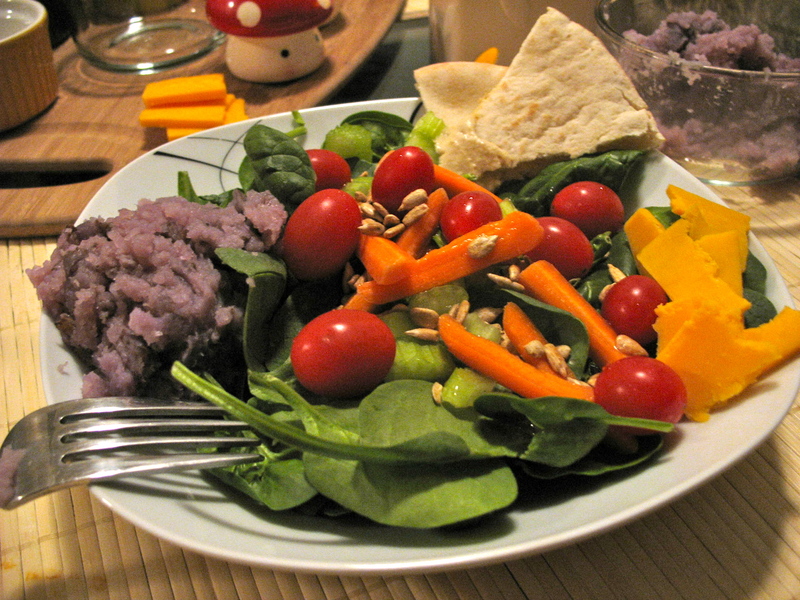 There are many great sources to fit a variety of palettes and dietary preferences: beans, tofu, cheeses, lean meats, etc. 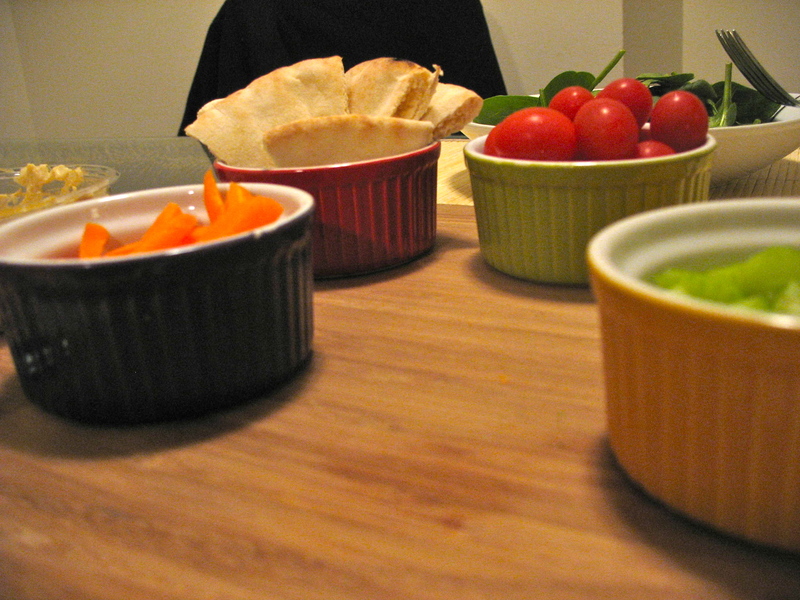 Cute, colorful ramekins are not necessary - but they are encouraged! 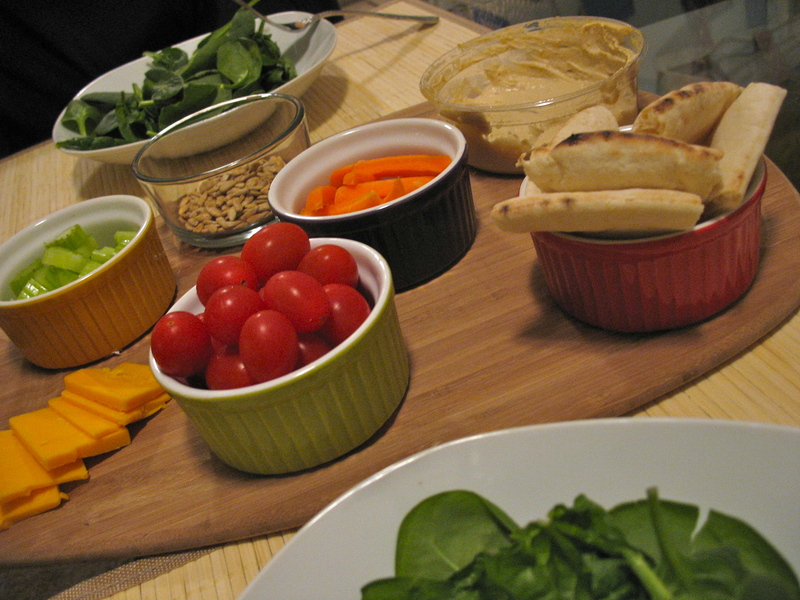 These are the toppings that really bulk up a salad, items like veggies (carrots, celery, fresh corn, tomatoes, etc. ), fruit (apples, strawberries, pears, etc. 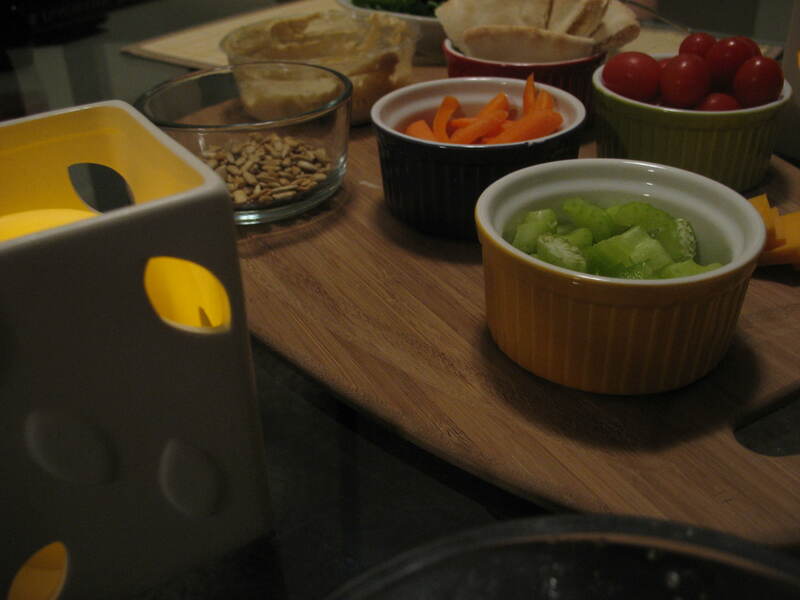 ), and other items that aren’t just for decoration but substantial flavor and nutritional value. Step 4: Fix up your fixins’! 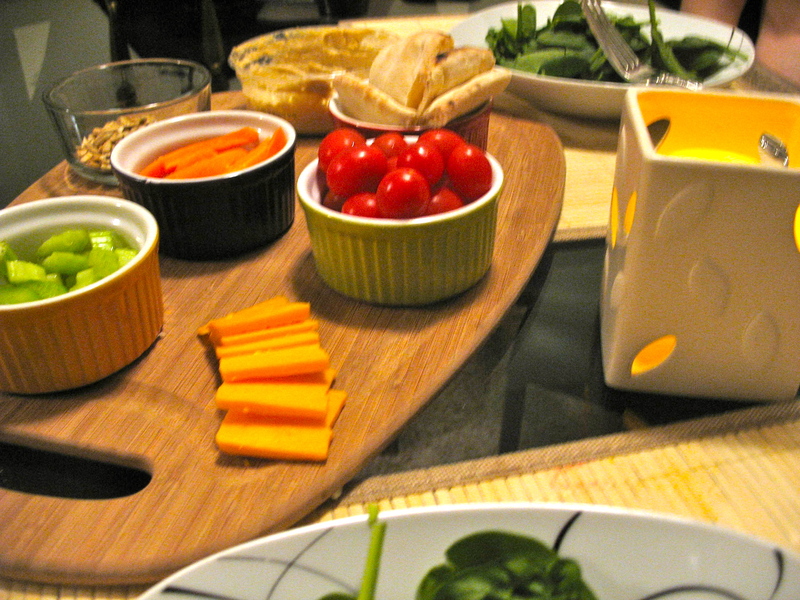 Here’s where you can have some fun and imagination with your salad (and even go with some for decorative purposes). I like thinking of the fixin’s as the icing on your salad: small touches that add special flavors, textures, or colors, but you don’t need a lot to do so. Think of sunflower seeds for crunch, dried fruits for flavor and color, and croutons for a different taste. Now for the true finishing touch: your dressing. I like having a variety on hand so I can make a lot of different types of salads: savory, sweet, simple, complex. My new favorite dressing is a lemon vinaigrette with brown sugar and cinnamon. It sounds odd, but is amazing – a great motivation to try new flavors. BF and I enjoyed a great salad bar of our own, and cleared out a lot of veggies we had piling up in the fridge. 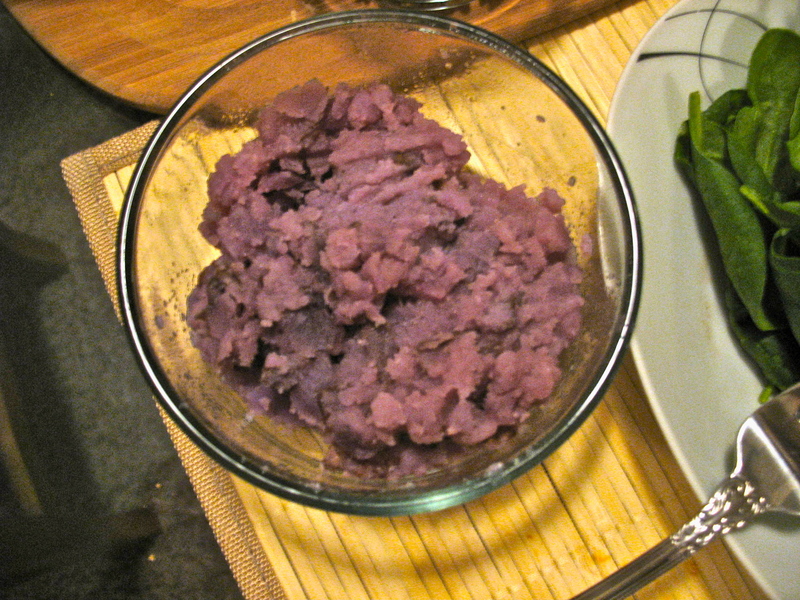 We even made good use of the leftover purple mashed potatoes! Now that’s my kind of bar. I love this post 🙂 beautiful pictures!